Pune is one of the fastest-developing cities in India and two-wheelers are a preferred mode of transportation for a large section of people. With the number of two-wheelers that hit the roads in Pune increasing consistently, the number of accidents are also likely to rise. In case of an unfortunate event on the road, individuals who are involved in an accident can incur a lot of expenses owing to injuries, damages or even death. Such expenses are often high and make it difficult for individuals to meet them unless they are insured. The Government of India has made it compulsory for all vehicles being used on the streets of India to be insured. The Liability-Only policy is the least an Indian rider must possess so as to ensure that a third party injured due to an accident in which the policyholder was involved will be covered. Most insurance companies collaborate with garages across India in an effort to ensure that the insurance process is smoother. Customers who purchase two-wheeler insurance plans in India can derive the benefit of cashless claim settlement at garages that have partnered with the company from which they purchase the insurance. 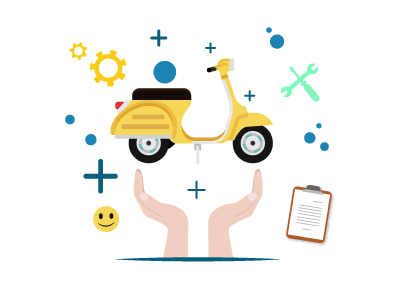 In case the policyholder opts to have the insured two-wheeler repaired at one of the network garages, the insurance provider shall deal directly with the garage in the sense that it shall pay the bill for the repairs. All the policyholder will have to do is pay the amount exceeding the insurance cover or any portion of the bill that the insurance plan does not cover. Different insurance companies have partnerships with different garages. There are different ways through which you can locate a network garage regardless of which insurance company you choose. A list of garages that offer the cashless facility is usually included in the policy document or brochure issued by the insurance company. These garages can also be located on the official website of an insurance company by simply visiting the relevant section on the website and selecting the city and location. Another way through which customers can get access to network garages is through the customer service team of the company which can assist them over the phone. Once the insurance company has been intimated about a claim by a policyholder, the insured vehicle will have to be taken for repairs to a network garage. For the claim to be processed, the policyholder will have to furnish a few documents as requested by the garage in addition to the policy number. The insurance provider will then be contacted by the network garage for an approval. Once approved by the insurance company, repairs will be carried out and the bill will be settled directly by the insurer. As the insurance company partners with the garage, the claims process can be completed relatively quickly since the insurance company already holds all the information of the garage, and as a result, the turn-around time is shorter for both approval as well as settlement of claims. There are also fewer hassles involved. Out-of-pocket expenses are basically those that are not covered by an insurance policy. Policyholders may have to cover costs of the bill that the insurance policy does not cover. These expenses include depreciation on spare parts of the two-wheeler. If you are looking to purchase a two-wheeler insurance policy, there are a number of factors that must be kept in mind. The coverage offered by a policy is the most important factor to consider when choosing a two-wheeler insurance plan. While some policies cover only damages to third parties, there are other plans that offer comprehensive coverage which includes own damage as well. Customers will have to determine whether or not they require comprehensive coverage as the premiums may be slightly higher. But if you can afford the premiums, it is advisable to purchase a comprehensive cover, as doing so will ensure that you have maximum protection. The premium rates associated with a two-wheeler insurance policy are calculated based on several different factors. The make and model of the two-wheeler as well as its cubic capacity is taken into consideration, along with the city in which the two-wheeler was purchased and registered. Even details of the rider are taken into consideration when computing premium rates. Insurance companies that provide cashless facilities at network garage will ensure that you save a good amount of time when making claims. Customers will not have to pay for the repairs to their vehicle as costs will be covered by the insurance company and paid by them directly to the garage. Customers will only have to pay for costs that are not covered by the insurance policy. Most insurance companies have a limit up to which they cover third-party damages. While a lot of insurers have no such cap for the death of a third party, claims are usually capped at Rs.1 lakh in case of damage to third-party property. A good number of insurance policies come with No Claim Bonus. It is a feature that allows you to avail a discount on the premium during the renewal of a policy in case no claims have been made during the policy term. Customers who wish to sell their bike will have to fulfil a few formalities. To start off, the transfer of ownership of the two-wheeler has to be made. Moreover, the two-wheeler insurance policy will also have to be transferred to the new owner of the vehicle. In case you decide to sell your bike, you will first have to inform the Regional Transport Authority about the same and obtain a No Objection Certificate to ensure that you will not be held accountable for anything to do with the two-wheeler. Get in touch with your insurance provider and inform them about your intention to transfer your insurance policy due to the fact that your vehicle is going to be sold. In case a No Claim Bonus has been accumulated under the insurance policy, you will have to draft an application for a No Claim Bonus certificate. This bonus cannot be transferred and this certificate must be obtained to ensure that the bonus stays in your name. This certificate can be used when applying for a new insurance policy. If the individual who intends to purchase your two-wheeler meets the eligibility criteria of the current policy, the same will be transferred to him/her by the insurance provider. Once the required personal information has been provided by the new owner, the policy transfer will be complete.